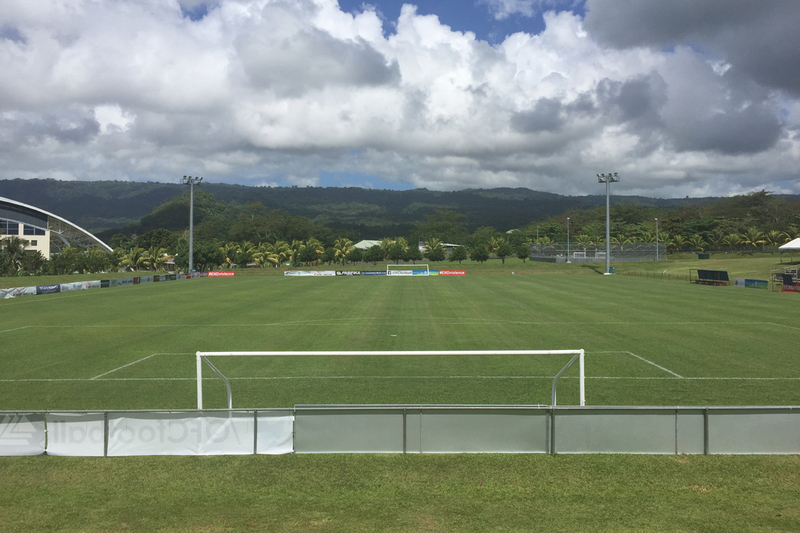 New Caledonia and Tahiti are expecting tough assignments this Saturday when they take on hosts Samoa and defending champions New Zealand, respectively, in the first day of action for Group A in the OFC U-16 Women’s Championship. With a passionate Samoan crowd on the sideline for Saturday’s opening match, New Caledonia coach Matthieu Delcroix believes the atmosphere will add to the challenge as many of his players make their first appearance on the international stage. “It will be a tough draw to begin this tournament,” he said. Although he’s approaching the game cautiously, Delcroix is still confident that his side is well-prepared and eager to prove themselves. “I think we’ve all grown up over the past few weeks,” he said. Samoa coach Guillermo Schiltenwolf is well aware of the difficult matches ahead in Group A, but with a few international recruits adding experience to his side, he’s looking forward to seeing a competitive Samoan squad turn heads in their opening clash. “The challenge for us is to try and make the top four. It’s going to be hard because our group is very tough but the girls are ready,” he said. “We’ve had a few good players come in – one from Australia a few players from the United States. They are very talented players. The local players are also good and some of them will definitely be in the starting line-up. The afternoon match will see debutants Tahiti hit the ground running as they take on four-time consecutive champions New Zealand. Although the draw first came as disappointing news to Tahiti coach Stéphanie Spielmann, she now believes her side is well-prepared and ready to face the first match head-on. “At first we were a bit worried to play against the best team up first. Now we think it’s a good thing because New Zealand is a great team but we think we can beat them. I’m sure it will be a great match,” she said. Although New Zealand coach Leon Birnie is confident in the ability of his side, he is expecting a tough opening encounter against Tahiit – especially in Samoa’s hot conditions. “We know very little about them and we’re going into the unknown in this first game but the girls are excited as this is their first international fixture. We’re really looking forward to it,” he said. With the FIFA U-17 Women’s World Cup Uruguay 2018 only one competition title away – and expectation riding on their shoulders – Birnie is keeping his feet on the ground and focusing on each match as they come. “It’s a new group and for these players, it’s their first time over here. We’ve come here to qualify, that’s one of our goals, and it’s their first experience at this level,” he said. “While I guess we are favourites and we have done well in the past, it’s a new group, it’s football and anything can happen. Vital Statistics: Samoa will be looking to improve their placing at the 2017 OFC U-16 Women’s Championship appearance after finishing bottom of their group in their debut last year. The Players: Taking the field for her country for the first time, New Zealand-based goalkeeper Meripa Seumanutafa has a lot to offer between the posts. Although she’s only 15 years old, Seumanutafa has developed a mature perspective on the game through her experience in the AFF/NFF Women’s Conference league in Auckland this year. Her calm and control in the box – and her impressive reflexes – make her a difficult final defender. Samoa 1. Meripa SEUMANUTAFA (GK), 2. Angie VON HEIDERBRANDT, 3. Sina SATARAKA, 4. Michayla CHAMBERLAIN, 5. Tiare TUIMAVAVE, 6. Faith TAEOALII, 7. Alisa TUATAGALOA, 8. Zoe RUBY, 9. Madeleen AH KI, 10. Nagem UIAGALELEI, 11. Kaylani LAUTAIMI, 12. Helina PAULO, 13. Paepae TUITAMA, 14. Mata TALIU, 15. Vineta FALEAANA, 18. Andreya HALL, 20. Alana TUALAULELEI (GK). Vital Statistics: After a strong start, New Caledonia were unfortunate to place so low in the previous edition of the competition. The Francophones finished second in their group behind New Zealand and continued on to the knockout stage, but close losses to Papua New Guinea and Fiji saw them finish the competition in fourth place. The Players: Marie-Laure Palene is the only player for New Caledonia with experience at an OFC competition. Palene travelled to Auckland last month to contend in the OFC U-19 Women’s Championship, playing full matches against Samoa, Papua New Guinea, New Zealand and Tonga. The young midfielder defends and attacks with relentless determination, creating opportunities in front of goal for her teammates and taking attempts herself when the shot is on. Vital Statistics: Tahiti will be making their OFC U-16 Women’s Championship (previously OFC U-17 Women’s Championship) debut when they meet New Zealand on Saturday. The Players: Although Naniloa Maro has only recently turned 14 years old, making her the youngest player in the squad, she’s proven her ability to stand her ground in the backline and contribute forward when the side transitions into attack. As the only representative from her domestic club AS Aorai, Maro will be eager to make an impression at the OFC U-16 Women’s Championship. Tahiti: 1. Vahinerii PURAGA (GK), 2. Hitiana LONG TANG, 3. Vahinerii KIMITETE, 4. Joelle TEPEA, 5. Naniloa MARO, 6. Lokelani HAUATA, 7. Merehau IOTUA, 8. Tevahine TERIINOHOPUAITERAI, 9. Christiane TETAVAHI, 10. Tiare TEKAKIOTERAGI, 11. Tahia TAMARII, 12. Vahuariki TUFAUNUI, 13. Heipua KOHEINUI, 14. Vaihei SAMIN, 15. Ranihei MAHAI, 16. Hélène TEMUTU (GK), 17. Anais TUUA-TAVE, 18. Heidy MARAE, 19. Corail HARRY, 20. Pare FLORES. Vital Statistics: After participating in every edition of the competition since its inauguration, New Zealand remain unbeaten. The Players: Britney Cunningham-Lee and Grace Wisnewski have both proven themselves dangerous attackers for club Hamilton Wanderers in their domestic league back in New Zealand. Their youthful speed and agility along with their ability to read the game – having developed a strong ability to read play through their experience in senior level football – gives them an extra edge up front.